"Your online music patterns library!" It's filled with thousands of chord progressions and melodic patterns all waiting to be explored and added to your music. 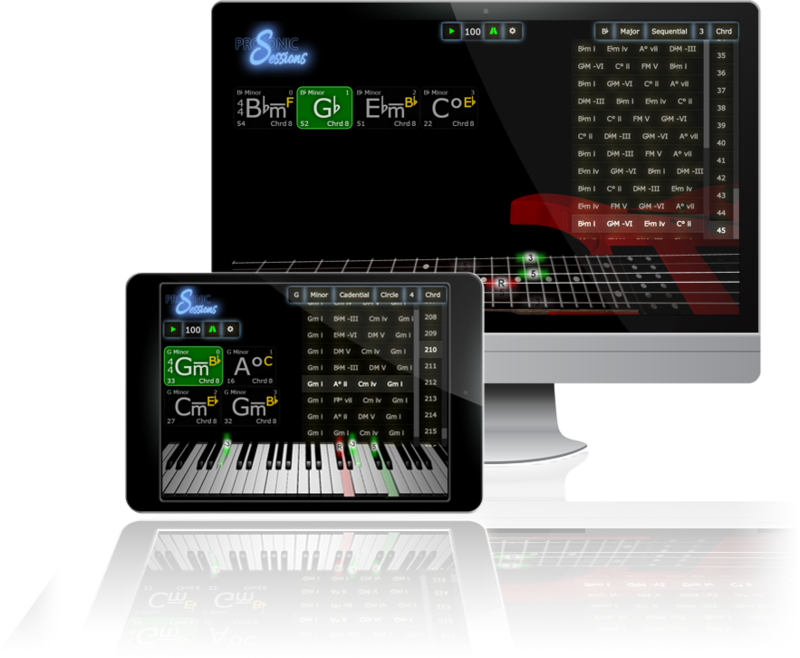 Get thousands of great chord progressions and melodic patterns for FREE. Then learn them super fast in the 3D Simulator! Play Guitar, Piano, or Bass? 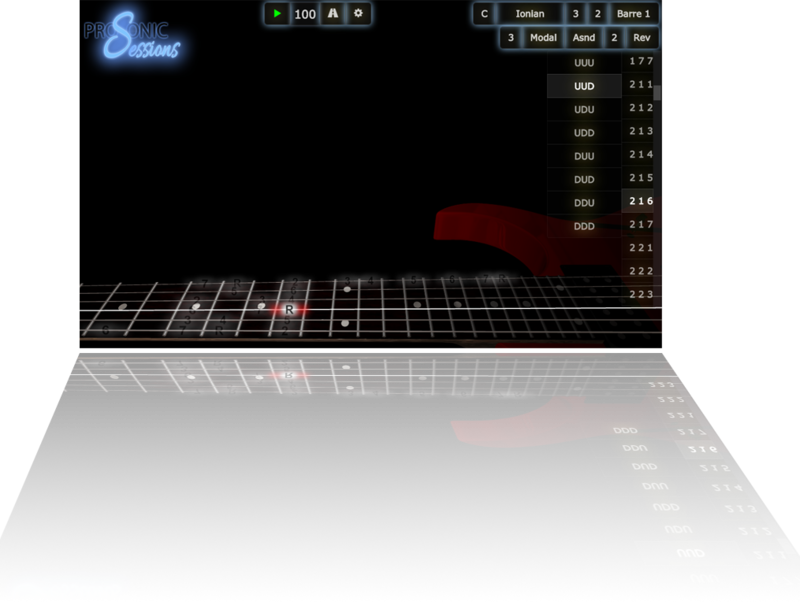 Find high-quality music patterns and practice them in Prosonic's 3D Guitar Simulator. 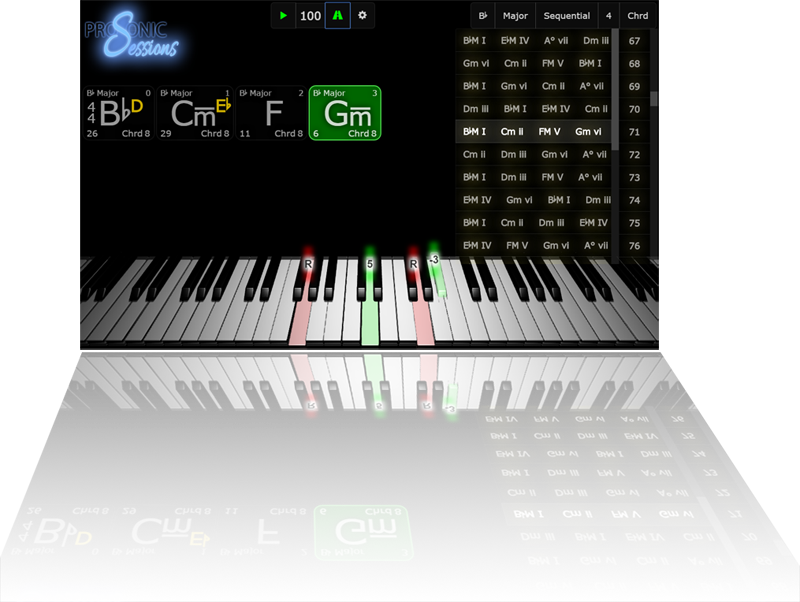 Find high-quality music patterns and practice them in Prosonic's 3D Piano/Keyboard Simulator. 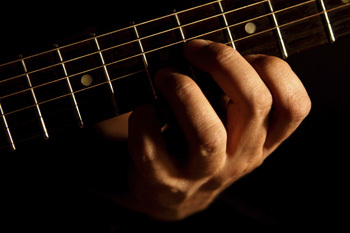 If you play guitar, piano, or bass then you've just found the ultimate online "music book". 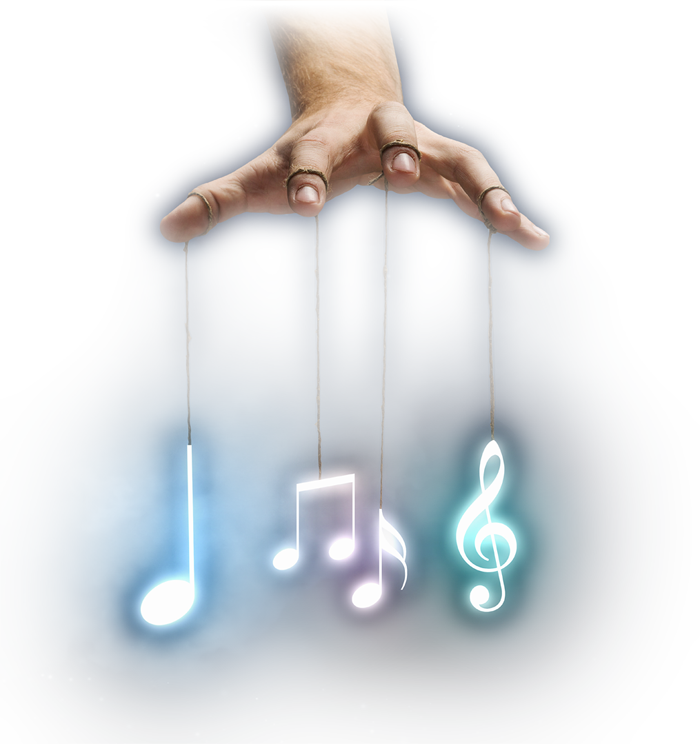 This website is packed with thousands of high-quality chords, scales, chord progressions, and melodic patterns all waiting to be explored, and added to your music, royalty-free. So start a Session now FREE! There's an endless supply of inspiration in this library and each pattern is carefully crafted to follow the very best harmony and voice leading rules. Every single pattern is of the highest quality. This isn't a video game or "kids toy". Prosonic Sessions ™ has a huge collection of pro-quality chord progressions and melodic patterns. It's also a high-quality learning tool that makes learning new ideas easy and fun! 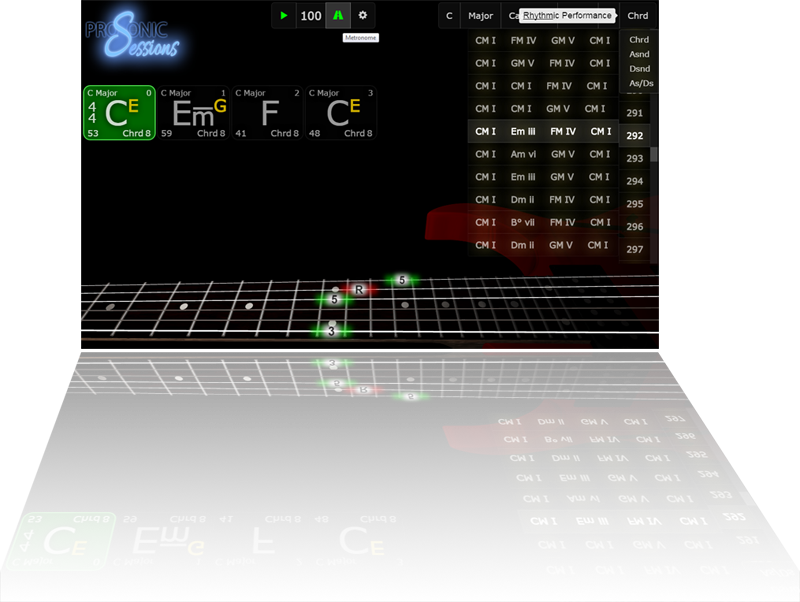 Imagine a "chord book" or "scale book" that shows the chords and scales being played on the instrument with audio and animated 3D graphics! 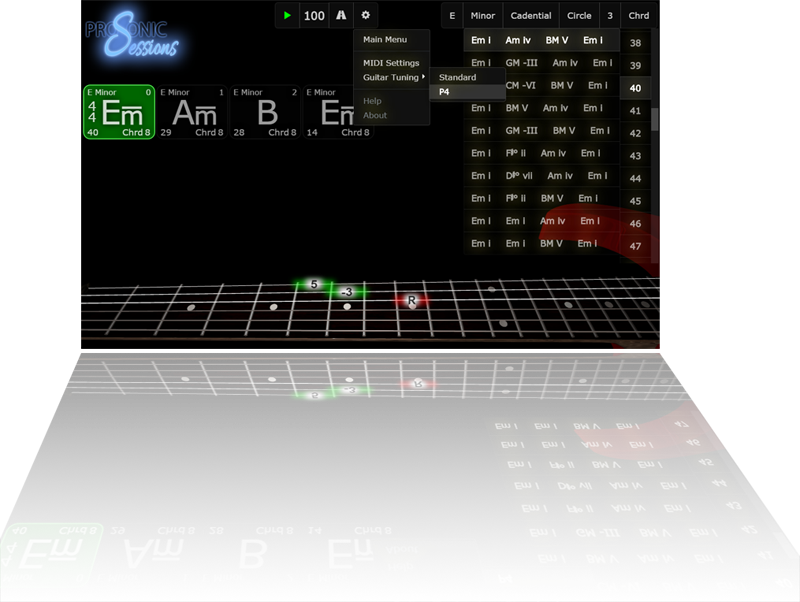 Sheet music, TAB, and chord diagrams could never do that! You can see and hear the patterns played in real-time so learning is much easier. The built-in metronome allows you to set playback to a speed that's comfortable for you. Then speed it up as you get better. 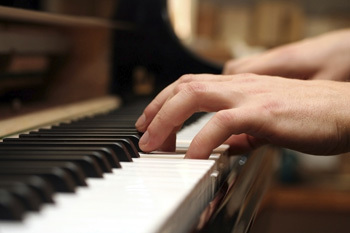 Use Prosonic Sessions ™ to practice rhythms too! 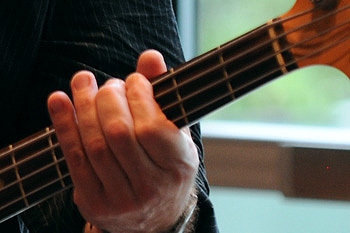 Multiple rhythms are included, like: chordal, ascending arpeggio, descending arpeggio, etc. The goal is to make your own music. Find the patterns you like. Practice them in the simulator. Practice becomes Memorization → Mastery. Then Modify/Expand to make them your own. All of our patterns are royalty-free so you can use the patterns in your own songs and they're perfect for improvisational "jam sessions" too! Alternate tunings. For Guitar & Bass. P4 tuning included for guitar! *All patterns are included for guitar tuned in 4ths so bass players can use Sessions ™ too!